Vessel in the Form of a Kneeling Female Figure. Arkansas, Crittenden County, A.D. 13001500; shell-tempered ceramic; private collection, Missouri. Hero, Hawk, and Open Hand: American Indian Art of the Ancient Midwest and South explores the themes of a major branch of early civilization in the Americas that is virtually unknown to the publicthat of the midwestern and southern United States. The exhibition assembles some 300 masterpieces of stone, ceramic, wood, shell, and copper created between 2000 B.C. and A.D. 1600 and presents them in the context of large-scale plans and reconstruction drawings of major archaeological sites. Sculptural forms embrace a wide range of human, animal, and vegetal motifs, as well as composite imaginary creatures, abstract shapes, and embellished vessels, implements, and items of ritual paraphernalia. Hero, Hawk, and Open Hand: American Indian Art of the Ancient Midwest and South exhibition catalogue: 288 pages. Hardcover, $60; softcover, $34.95. Click here for more information. Journey to Cahokia: A Boy’s Visit to the Great Mound City: 32 pages; 21 color illustrations. Hardcover $17.95. Click here for more information. Hero, Hawk, and Open Hand: American Indian Art of the Ancient Midwest and South is organized by the Art Institute of Chicago. 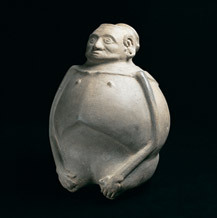 Hero, Hawk, and Open Hand: American Indian Art of the Ancient Midwest and South will be on view at the St. Louis Art Museum, March 4May 30, 2005. Individuals descending from Shawnee, Potawatomi, Osage, and Miccosukee Seminole Nations have also contributed directly to diverse aspects of the exhibition catalogue, educational programs, and exhibition presentation. This exhibition was organized by the Art Institute of Chicago and made possible by major funding from the National Endowment for the Humanities, expanding our understanding of the world. The Chicago presentation is generously supported by The Boeing Company. This presentation is generously funded by the Clarence Spanjer Endowment and is supported by an award from the National Endowment for the Arts, which believes a great nation deserves great art. Additional support is provided by the Community Associates of the Art Institute of Chicago and a generous gift from the Thaw Charitable Trust. Last updated: February 2005. Best viewed with Netscape Navigator 4.0 or higher. Reproduction Permission. Copyright © 2003. All rights reserved.